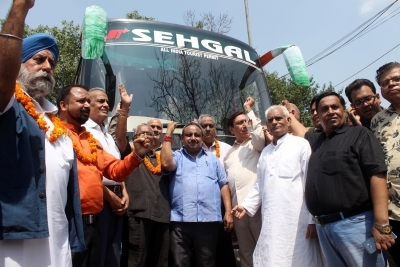 New Delhi Sep 15 (IANS) The Confederation of All India Traders (CAIT) on Saturday started a 90-day "National Rath Yatra" protesting against foreign direct investment (FDI) in retail and the Walmart-Flipkart deal. The protest movement named "Sampoorn Kranti Rath Yatra" started at Red Fort here. It will cover various parts of the country and culminate at the national capital on December 16 according to the Confederation. "The yatra after covering almost all states of the country will culminate into a Mass Rally on December 16 at Ramlila Ground New Delhi " CAIT said in a statement. Besides CAIT had also earlier called for a "Bharat Trade Bandh" on September 28 against the Walmart-Flipkart deal and FDI in retail trade. On August 28 the Confederation had approached the National Company Law Appellate Tribunal (NCLAT) against the Competition Commission of India (CCI) s approval for the Walmart-Flipkart deal. Last week NCLAT issued a notice to Walmart enquiring about its business model under an appeal filed against the Walmart-Flipkart deal by CAIT. On August 18 Walmart Inc acquired approximately 77 per cent stake in e-commerce major Flipkart. Walmart now holds approximately 77 per cent of Flipkart while the remainder of the business is held by other shareholders including Flipkart co-founder Binny Bansal Tencent Tiger Global and Microsoft Corp.
Walmart s investment includes $2 billion of new equity funding to help accelerate the growth of the Flipkart business and both companies will retain their unique brands and operating structures in India.